For many survivors of suicide loss, the journey of healing can be lonely, painful, and confusing. Survivors may feel ashamed as if the suicide was somehow their fault. They may feel abandoned by friends and family who don’t seem able to give them the comfort and support they need, and who may even blame them. They may not know anyone else who has ever been through this and feel they have no one to talk to who can really understand their experience. At Fox Valley Institute we understand this struggle and have three means of support for survivors of suicide loss. 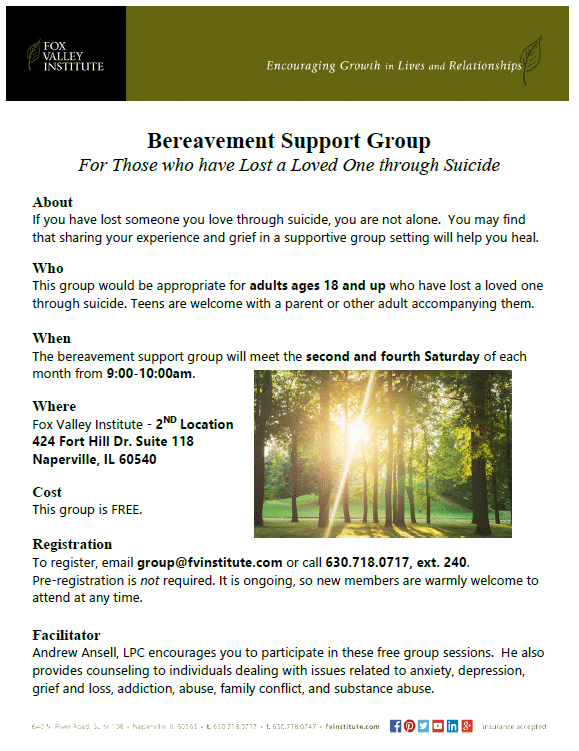 First, we offer a monthly Bereavement Support Group for adults who have lost a loved one through suicide. It meets the second and fourth Saturdays of each month from 9:00-10:00am at Fox Valley Institute’s second location. There is no cost for this group and it is open-ended so new members are welcome to join at any time. Please call the office at 630.718.0717, ext. 240 to be added to the bereavement email list. Second, we are an annual host site for International Survivors of Suicide Loss Day. This event is held each year on the Saturday before Thanksgiving. The conference is sponsored by the American Foundation for Suicide Prevention (AFSP). Look for information in late summer regarding the November 2015 conference. Lastly, the option to receive support through individual counseling is always available. We have caring therapists on staff who specialize in grief and loss. Evening and weekend appointments are available. To schedule an appointment, email group@fvinsitute.com or call 630.718.0717, ext. 240.